In the bible there are a list of wedding bible verses that deal with having a relationship with God. In bible illustrations the church is the bride and Jesus is the bride groom. Then there are wedding bible verses about marriage, between a man and a woman, that deal with what should or should not be done when they marry. Planning to get married? 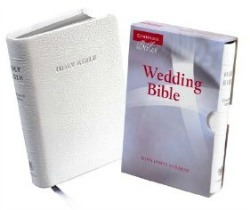 Following are bible verses used in weddings that you may find helpful. Genesis 2:24 (King James Version) 24. Therefore shall a man leave his father and his mother, and shall cleave unto his wife: and they shall be one flesh. 3. The Pharisees also came unto him, tempting him, and saying unto him, Is it lawful for a man to put away his wife for every cause? 6. Wherefore they are no more twain, but one flesh. What therefore God hath joined together, let not man put asunder. 6. But from the beginning of the creation God made them male and female. 8. And they twain shall be one flesh: so then they are no more twain, but one flesh. 9. What therefore God hath joined together, let not man put asunder. 31. For this cause shall a man leave his father and mother, and shall be joined unto his wife, and they two shall be one flesh. The fact that these wedding bible verses are repeated four times in the bible indicates the need to follow the counsel. Christian Printable Bridal Shower Games. Click here to read about Love Bible Verses. Click here to contact me with a question, comment, or suggestion.